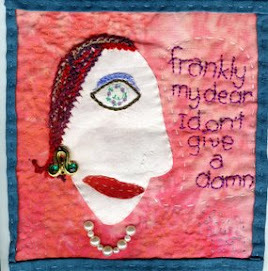 I have just done a 2 day workshop with Pearl Red Moon at the Embroiderers' Guild NSW and had heaps much fun. You can find some examples of Pearls work here. The face was a mold provided by Pearl which she has sourced in the US. I also took up Pearl's generous offer and made a couple more casts of a face which Pearl had made. I look forward to making a couple of more of these little treasures in the future using both stitch and beads. I will start with a postcard size to see how it goes.